The zauschneria are California natives and their cultivars. They do best in hot summers, full sun and well drained soils. 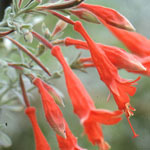 Their numerous reddish orange flowers are hummingbird favorites in late summer and fall. They spread by underground runners. This cultivar is has semitrailing growth.